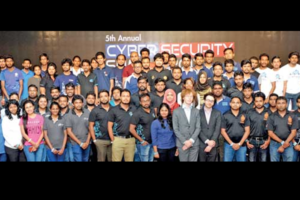 The CEO Forum of the 5th Annual Cyber Security Summit, Sri Lanka’s premier annual cyber security awareness initiative, was recently concluded at Cinnamon Grand Colombo. Jake Davis and Darren Martyn, hacktivists turned ethical hackers, gave insights about the mindset of hackers and how organisations should mitigate different cyberattacks to several top corporate leaders from different business sectors of the country. The CEO Forum also comprised of a panel discussion which included India and South Asia Visa Consolidated Support Services (India) Chief Risk Officer Shivkumar Sriraman, CISCO India and SAARC Security Business Director Vishak Raman, Bayshore Networks Senior Director for Industrial Control Systems Dr. Vincent Turmel and CICRA Holdings Group Director/CEO Boshan Dayaratne. Jake and Darren stole the limelight of the forum with some great insights about hacking, talked about the importance for a CEO to understand how a hacker’s mentality work and even did a live demo of a hacking by entering into a public Wi-Fi and sending a CISCO employee a text message, pretending that it was sent from CISCO Marketing Department. On the day of the main forum, the two ex-founder members of the internationally notorious hacktivist groups Anonymous and LulzSec have found over 43,000 (43,846) individual data leaks belonging to .lk domains in just 32 out of a total 2,500 breaches. They had found passwords, emails and other personal information among the more than 43,000 leaks belonging to important individuals. Darren however pointed out that the number has changed drastically over 24 hours. “This was yesterday; today the number is much bigger. We searched 39 breaches out of 2500 today, and the number has gone up to 60,856 records, which is okay though. We found less data in Sri Lanka than JP Morgan. Now you know that your country is less screwed than JP Morgan,” Darren laughed. Out of 63 people who have attended the forum, Darren said that 35 personalities have been personally affected by cyber criminals. 83% of the companies participated, according to Darren, have been impacted and many of them have been impacted by third part data loss. Nearly a third of the CEOs surveyed by KPMG International in 2016 saw cyber security as the issue having the biggest impact on their companies today. One out of five indicated that information security is the risk of greatest concern, while operational and compliance risks were listed as the top risks. But cyber risk, if uncontrolled, becomes an operational and regulatory issue very fast. 49% of the CEOs were fully prepared for a cyber-event but only half of CEOs had appointed a cybersecurity executive or team, and less than half had changed internal processes, such as data-sharing. Should you trust an ethical hacker? Jake and Darren suggested few mechanisms that could protect companies from cyber threats such as enhancement management – enforcing two-factor authentication, which will mitigate a number of risks. According to them, enforcing right methods will always help companies to limit the number of damages. “Security and resilience can affect nearly every part of an organisation. Strategies to protect IT security and business resiliency should align with an organisation’s broader goals, from protecting intellectual property to maximising productivity to finding new ways to delight customers,” Jake alluded. Organisations should determine how resilient they are in advance of a breach so they aren’t left flat-footed after the fact, said Darren at the CEO Forum. “They should begin by asking how they can prevent an attack, how they can withstand it, and how to respond. Part of this process includes understanding what your specific risks and threats are and from there, making a business decision on what actions your organisation is comfortable taking,” he explained. “But I believe it is always useful to have someone who understands both sides of the situation. The tools will help, but the skill is in identifying the hole and then knowing what you can do is also important. To replicate a hostile hack, you need the mindset to put together the right tools. A number of hacking tools available in the marketplace will only replicate certain easier attacks. That is where you require the help of an ethical hacker,” Jake said answering the same question. Answering the question of whether focusing on cyber security stifles innovation and business growth, CISCO India and SAARC Security Business Director Vishak Raman said organisations should not make the entire effort a headache. “Customers are serious about cyber security. One CEO of a Sri Lankan bank asked we could make cyber security a differentiator. It is a very candid conversation. CEOs should not think that security is a bane and an everlasting capital expenditure. For banking institutions, security can be a differentiator where the bank could do something special for their high net worth individuals and make sure that their banking transactions are well secured. Organisations are slowly moving away from that mindset of considering security as a bane. Many organisations are involved in digitising their business processes; security is very important to make those operations smooth,” said Vishak. The amount of data being generated currently is humongous. There are a number of cyber criminals who keep a close watch on this data to monetise but same amount of data could also be a solution. Shivakumar mentioned that organisations should look at doing analytics with this data set that would help them to create a profile of a consumer and differentiate a genuine usage and a fraud attempt. “It is a journey we need to start. 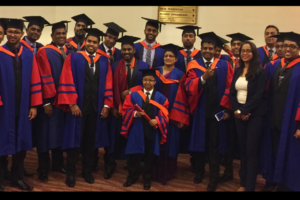 If we follow these strategies correctly within the next three to four years, I believe we could do a great change in this business space,” said Shivakumar. Addressing the gathering as one of the panellists, CICRA Holdings Group Director/CEO Boshan Dayaratne said most Sri Lankan companies are still indulged in a reactive mode when it comes to addressing cyber threats. Boshan mentioned that after giving a comprehensive report on security issues with a proper solution to remediate existing problems, many companies tend to lock away those reports in a locker without even properly assessing the situation. “When we come next year, we find the same vulnerabilities remain because people were not keen enough to go through a report,” said Boshan. CICRA has also found out few incidents where the top management firing employees of the IT department, after a security report has reached the board level of an organisation. “This is a wrong approach, especially on the management level. When we walk in to the organisation, the IT department will be sacred and at one instance, IT employees of a certain organisation blocked certain parts of the system where we could not access. A company pays us and we come and expose the vulnerabilities; it is not to find fault with your employees but a find solution to address issues, Boshan alluded further. Explaining the vulnerabilities which lie in industrial control systems (ICS), US-based Bayshore Networks Senior Director for Industrial Control Systems Dr. Vincent Turmel said ICS weaknesses can be found everywhere because they were designed based on open controls and old-fashioned industry designs. “Cyber criminals take advantage of following loopholes to research and initiate attacks: Lack of encryption and authentication, backdoors and “holes” in the network perimeter, devices with little or no security features, database security vulnerabilities, insecure coding techniques in product design and lack of control mitigation technologies,” Dr. Vincent pointed out. Apart from cyber security threats, Dr. Vincent said that industrial controls are vulnerable for few specific threat types – internal threats and outside threats. “Many organisations tend to think that they are not a target of any group. You may be wrong and you never know what weakness lie in your systems where a cyber-attack could topple your organisation. A clear understanding of the common weaknesses in ICSs helps corporate boards, executives and security officers engage in knowledgeable conversation about security, ask discerning questions, and make sound investments,” Dr. Vincent said at the forum. The strategic partners of the 2017 Cyber Security Summit were Cisco and Visa. 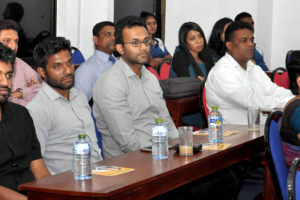 The other partners were LB Finance PLC, LankaPay, Airtel, Sri Lanka Insurance, Bayshore, ZeroFox, Ezy Intellect, Nations Trust Bank, Citibank, PrintHub, SriLankan Airlines, Cinnamon Grand, Triad and TV Derana, FM Derana and Ada 24×7 and Citrus Events Worldwide.